With profound sorrow we say goodbye to our dear Mom. 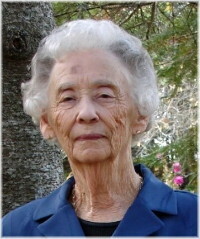 Kathleen, 102 years of age, passed away at the Lac du Bonnet Personal Care Home on Thursday, April 4, 2019. Mom is now free from the physical, mental and emotional constraints she had endured over the last few years. Left to love and cherish Mom’s memory are her daughters, Ann Quinn and Lynn Markert (Stephen), her sister Rose, nieces, nephews, cousins and friends. Kathleen was predeceased by her parents, Ernest and Edith Corder, husband John, son John, son-in-law Michael, sister Nancy, brother Ernie, niece Judy, sister-in-law Grace, brothers-in-law Len and Clare, Aunt Annie, Uncle Bill, several cousins and close friends. Mom was born in Transcona and the family later moved to St. James. Prior to her marriage she worked at the Children’s Home of Winnipeg. Mom absolutely loved the children she cared for. After marrying she worked alongside our Dad at Marjorie Shoe Service. In addition to being a working mother, Kay found the time to volunteer with groups such as the Anglican Church’s Ladies Aid Society. Mom was renowned for her pies! Upon retirement our parents moved to Silver Falls. Mom enjoyed many fun times with the good friends she made there. Mom was especially close to Tina and Meindert, and neighbours Ruth and Dave. Our heartfelt thanks to Mom’s nieces, Edith and Margaret, for their thoughtfulness over the years. Mom very much appreciated the cards, flowers, and special occasion gifts and goodies. Mom had many interests: playing piano, dancing, cards (bridge, cribbage), bowling, crossword puzzles, knitting (afghans, mitts, toques), embroidering tablecloths, reading, baking, making jam, jelly and pickles, music (from opera to the Beatles), cartoons, animated Disney films, her son John’s garden, and hummingbirds. She particularly loved children, animals, dancing, and a yummy dessert but loved her family most of all. Mom’s deteriorating health necessitated a move to the Lac du Bonnet Personal Care Home in July 2016. There she enjoyed life to the best of her ability given the restrictions of hearing, vision, and mobility loss. It was inspiring to see Mom participate in activities such as curling, bowling, move to the music, bocce ball and Happy Hour. We thank all the PCH staff for the love and outstanding care given to Mom especially over her last difficult days. Nurse Joy, dear friend Ruth, and daughter Ann were privileged to be present as Mom began her final journey and surrounded Mom with love and prayers. Cremation has taken place and there will be no service. If you wish, in lieu of flowers, please consider a donation in Mom’s memory to the Recreation Department, Lac du Bonnet Personal Care Home, Box 1030, 75 McIntosh St., R0E 1A0, (204)345-1210, or to your charity of choice. the laughter and good times. that you mean the world to us. Ann: Please accept our sincere condolences. This is a time to celebrate all the good times and memories we are sure you have of with your Mom. Our prayers are with you and your family. I am so sorry to hear of the loss of your Mom. She lived a long and remarkable life and you will have so many wonderful memories of her. My sincere sympathy. Ann, our deepest sympathy in the loss of Mom. Memories will last forever and we know you have many. We know it is so difficult at this time and we are all thinking of you.